This page has information on my 902-928 MHz station. See the left side of the page for other operating modes and projects. If this is not visable, click here to reload web page. I began working with EF Johnson 800 and 900 MHz radios in 2005, after learning about them on the Yahoo AR902MHZ Group. I was looking for an inexpensive radio for the 902-928 MHz Ham Radio band. I've worked with models 242-8615, 242-8640, 242-8655. They are often referred to by the last four digits of the model number - 8615, 8640, 8644 and 8655. I found that while some information is available, it's far from a simple Internet search away. I decided to put together some of the info I'd received on this web page. I hope that you find this information helpful, and have fun experimenting with 33cm! These radios are programmable via PC software. A simple interface connects between your PC and radio, and allows you to read the setup of a radio, or reprogram the radio. See my Schematics Page for two easy programming interfaces.. These radios feature PL and DPL encode and decode, and apparently in any combination. This ensures compatibility with any repeater, and also gives many possibilities when these radios are used for RF linking. It's taken me some time to get used to operating a commercial radio. Until now, I've been using Amateur equipment, (which some commercial guys frown upon) where virtually all controls are accessible from the front panel of the radio. 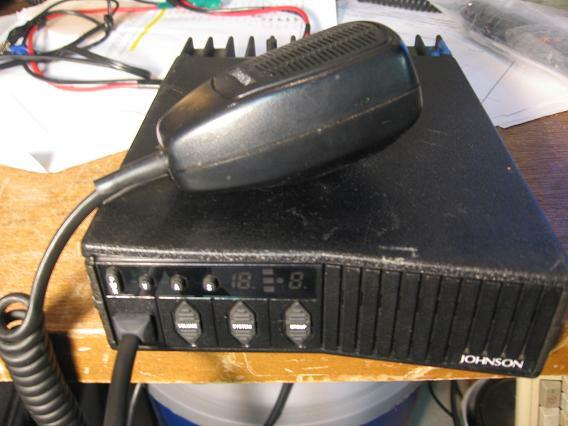 On these Johnson radios, the Squelch, RF Power output, mic gain, and RF gain are all set inside the radio! The frequency and PL/DPL must be programmed in advance (there is no VFO mode). The 8655 is the preferred mobile rig to look for, as it has many features the 8640/8644 do not, such as Talkaround (hams call this simplex). This radio can even be used as the transmitter for a 902 / 927 MHz repeater, and is an ideal candidate for RF linking purposes. The 8640 is a bare-bones mobile radio. The 8644 is the same radio with just 4 memories! These radios work fine for repeater use, but cannot be used for simplex operation, as they do not have the Talkaround feature. This radio is a proven performer, however, so don't pass one up if the price is right! The 8615 is an 800 MHz mobile rig that can be modified for use as a 902 MHz receiver. This is useful for those building a 902/927 MHz repeater. Below are some modifications I've learned of. Please pass along any other tested modifications you may have. The first step for all radios is to disassemble the upper and lower covers of the radio, and remove the audio/logic board. This board is located under the top cover, and is secured by six screws. Remove the six screws, and carefully turn the audio/logic board over, opening the radio like a book. If a cable is connected to the (14 pin) P2 connector on the audio/logic board, unplug it after noting the cable's orientation. 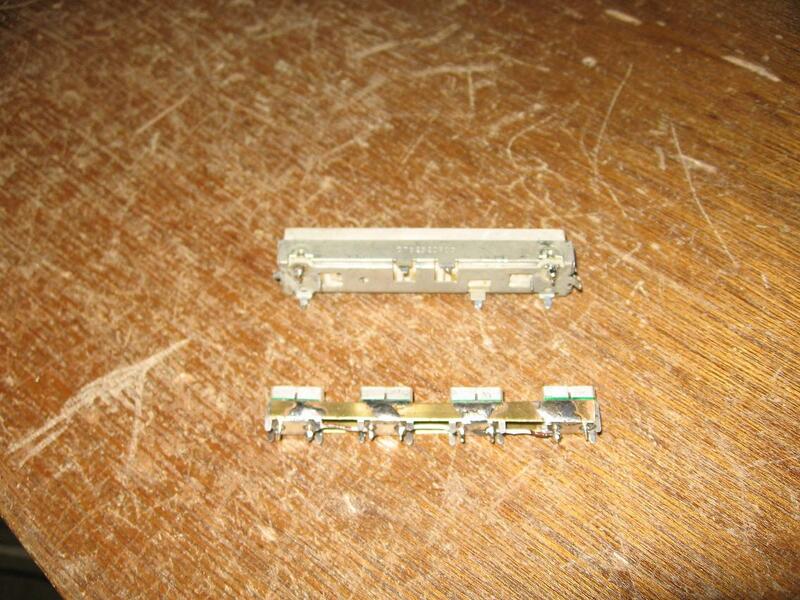 It is not necessary to remove the flexible ribbon cable between the RF board and audio/logic board. Use two of the longer screws to secure the audio/logic board to the left side of the radio's chassis. A strip of foam should be present on the solder side of the PCB to insulate the audio/logic board from shorting out. If necessary, place a strip of electrical tape along the metal radio chassis before securing the audio/logic board. The radio can be powered on and tested while opened up in this fashion. Converting the 8655 for ham use requires a CPU change, and possibly a surface-mount capacitor change and/or fine-tuning of the VCO. The CPU is socketed on the audio/logic board. Note that pin 1 is oriented toward the front of the radio. After replacing the CPU, the next step is to program some Ham frequencies into the radio. The 8655 uses FCC channel numbers 401-479. Refer to the Chart courtesy of N2MCI. Program some frequencies at each end of the band, even if you don't intend to operate there. Also program some frequencies in Talkaround mode. Write down these channel numbers for use in the next step. This programming will be useful for the next step of checking the VCO voltage. You can easily reprogram the radio later for your desired frequencies. Measure the radio's voltage at TP 801, which is located under the VCO cover on the RF board. There is a hole near the center of the VCO cover to allow measuring the voltage without removing the cover. With a dummy load attached, measure voltage on both RX and TX. The Service Manual gives a spec of 4.5 - 8.0 VDC, but with the Ham CPU installed, you won't be able to get the radio to operate at these voltages. You want about 2 volts or more on receive and less than 8 volts on transmit. Don't forget to also test voltages in Talkaround mode. Under about 2 volts in receive mode, and the receiver won't function. Above about 7 volts in transmit mode, and the radio won't transmit. Be sure to test several frequencies to ensure operation across the entire band. Some radios will not need any retuning! If your radio's voltages are all in line, congratulations! For link and/or repeater transmitters you'll want to dial down the RF power. I'd recommend running 5 watts or less to keep the radio cool, and also run an external cooling fan. 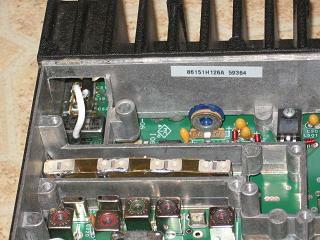 The pot for the RF output has a blue knob and is located at the rear of the RF board. The VCO retuning procedure involves a little bit of trial and error. It can be rather time-consuming, depending on your level of experience and what your voltages happen to be. For a full-featured mobile radio, we need the VCO to function correctly in 3 modes (902 Transmit, 927 Receive and 927 Transmit for Talkaround). If you plan to use this radio as a repeater transmitter or link radio, you can concentrate on only the mode your situation requires. Some exerimentation will be necessary when retuning, but I'll provide you with the basic idea. 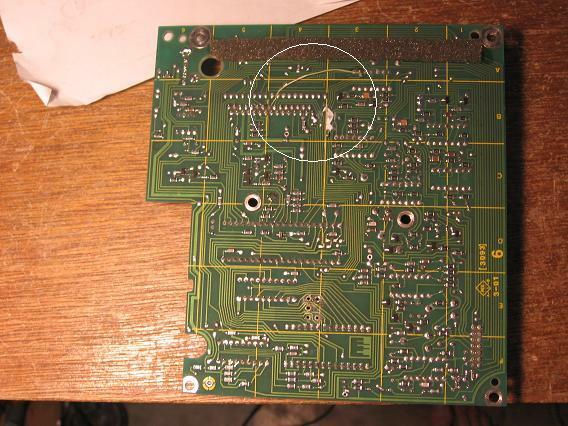 Remove the VCO cover, which is the large metal cover on the top of the RF board. The radio can be operated for testing with this cover removed, but you should know that the VCO voltage will change 1-2 volts when the cover is re-installed. With the radio oriented normally (top side up, face plate towards you). To the right of TP801 you will see a backwards L shape . The horizontal strip is the MAIN (non-TA) adjustment, and the vertical strip is the Talkaround adjustment. Remember that any adjustment will likely cause voltages in other modes to change as well. If the voltage is too low, cut the jumpers on the strip. If the voltage is too high, reconnect the jumpers on the strip. The surface-mount capacitor included with your CPU is used to raise the voltage in receive mode. It is not always necessary, but if you're doing any major retuning it's a good idea to change it. The capacitor (C917) is installed on the bottom of the RF board, underneath the large metal cover. I'd recommend that you obtain a copy of the Service Manual to correctly identify this capacitor. It's usually available in PDF format. Converting the 8640 or 8644 for ham use requires a CPU change, and replacement of a surface-mount capacitor (c720) in the VCO. Replace this capacitor with a 33 pf surface-mount capacitor. The CPU is socketed on the audio/logic board. Note that pin 1 is oriented toward the front of the radio. After replacing the CPU, the next step is to program some Ham frequencies into the radio. The 8640/44 use FCC channel numbers 1-79. Refer to the Chart courtesy of N2MCI. Program some frequencies at each end of the band, even if you don't intend to operate there. Write down these channel numbers for use in the next step. Next, measure the radio's voltage at TP 801, which is located on the RF board. With a dummy load attached, measure voltage on both RX and TX. You want about 14-17 volts or more on receive and 7-9 volts on transmit. Be sure to test several frequencies to ensure operation across the entire band. Converting the 8615 for ham use requires a CPU change, and replacement of the front-end filters. The CPU is socketed on the audio/logic board. Note that pin 1 is oriented toward the front of the radio. After replacing the CPU, the next step is to program some Ham frequencies into the radio. The 8615 use FCC channel numbers 81-120. Refer to the Chart courtesy of N2MCI. Program some frequencies at each end of the band, even if you don't intend to operate there. Note that the firmware on the new CPU forces the radio into Talkaround mode all the time, so disregard this setting in the programming software. Write down these channel numbers for use in the next step. Using a 902 MHz transmitter, verify that the receiver works on your programmed frequencies, and that the audio quality is good. One word of advice - use zipper-type sandwich bags to hold hardware removed during this process. A felt-tip marker can be used to write on the bag, or write on a piece of masking tape to identify where the hardware came from. This will GREATLY aid in reassembly. This radio has several different length Torx screws, and it could be a disaster if you mix these up! First, remove the audio/logic board. The ribbon cable is released by gently pulling up on the clasp tabs on each side of the ribbon cable. Unscrew the nut that attaches the antenna connector and remove the lock washer. 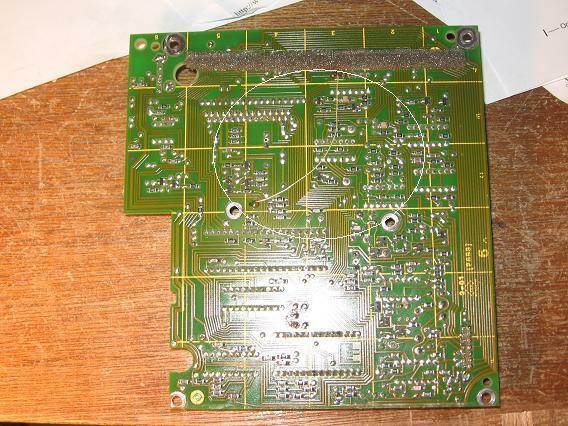 Remove the metal VCO cover on the RF board. You can see the TXCO sticking up through the middle of the VCO cover. Disconnect the front panel speaker's connector, and peel back the tape used to secure the speaker's wire. Remove the front faceplate, and be careful not to stress the electrical connector from the faceplate to the RF board. Near the speaker area of the RF board, look for a metal 'top hat' that is used to secure 3 power transistors. Remove the attaching screw, and carefully remove the 'top hat'. Next, locate the power transistor at the rear of the RF board, secured with one screw. Remove this screw, and carefully lift the transistor slightly. Turn the radio over and remove the large metal grounding plate on the bottom of the rig. It is held in place by about 15 screws. Near the antenna connector, locate the component held down to the radio chassis with two screws - remove these screws. Remove the remaining screws holding the RF board to the chassis. Carefully remove the RF board from the chassis and take a break! You're done with one of the toughest parts! Locate the front-end filters near the antenna connector. The filters are pictured here inside the red oval. There's not much benefit in keeping the old filters, as they don't work on the ham frequencies. After you've built the replacement filters, the old filters can be thrown away. Be careful with the RF board, of course, but feel free to destroy the filters during this process. Using small clippers, cut as many of the filter's ground connections as possible. Every ground connection that you can cut is one less that you'll have to un-solder to remove the filters. In addition to having about 9 ground lugs, the filters also have input and output connections. These are placed very close to the ground lugs, so be careful not to accidently connect these lines to ground. It's not necessary to use a large soldering iron during this process. I use a simple 40 watt iron, which provides plenty of heat for this job. Using a larger iron or gun might result in burning up traces on the RF board. Note that on the filter's output connection, there is a surface-mount capacitor connected between the filter and ground. Remove this capacitor and discard it. After you carefully remove the filter, you'll want to unsolder ground lugs that you cut and clean up the RF board. Be sure to remove any solder drips and verify that the input and output traces have not accidently shorted to ground. Use an ohmmeter and/or a sharp hobby knife for this. 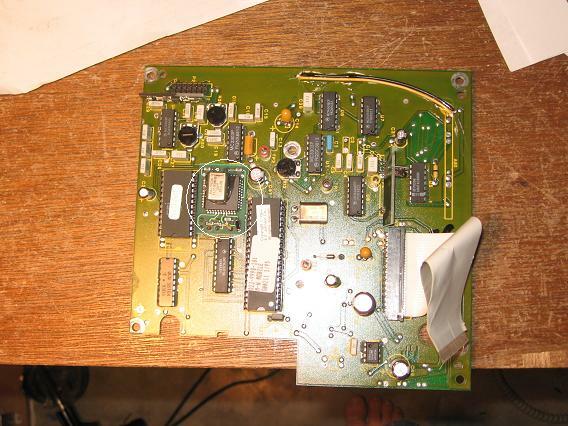 As you can see in this image, the filters are removed and the RF board has been cleaned up. The original filter had 3 ground lugs on the side closest to the front of the rig, and 4 in the back. The ground lugs on the ends are not needed for the new filters. Use a solder bulb or other tool to remove all solder from the 7 ground lug holes. The replacement filters consist of four 2-pole filters. We'll solder them together in the same size package as the old filters. Hobby brass works very well for this job, and is inexpensive. The thickness is not critical, but choose brass that will be rigid without being difficult to solder to. I believe I bought .025" the last time. Cut two thin strips of hobby brass the same length as the stock filter. These strips should be about 1/4" tall. Place the replacement filters on one strip of brass, evenly spaced, then put the second brass strip on top. With the filters sandwiched between the brass, carefully place the entire assembly in a small hobby vice or secure the ends with large alligator clips, vice grips, etc. Now it's time to flow some solder between the brass and each filter. Work quickly to avoid getting the filters too hot. I recommend a 40 watt iron for this job also, believe me, it's all you need for the job. Once cooled, remove the alligator clips or vice and compare your new filters to the stock filters. The most important detail here in the length of the filters. Test fit the new filters into the filter cavity of the radio chassis. Using some scrap wire, connect the 4 filters together in series. The two outside connections will be used as input and output lines, so you'll want to solder a 2-3 inch long piece of wire for connection to the RF board. Refer to this picture if unsure what to do - I used orange wire to connect the filters in series, and white/blue wire for the RF board connections. The next step is to find some scrap #14 AWG bare solid copper wire. You may have scraps left over from home wiring projects, as I did. If you must purchase some for this project, 1 foot will do. If necessary, bare all insulation from this wire. This #14 wire will be used to securely mount the new filters on the RF board and provide adequate RF grounding. Try a piece of this wire in all 7 grounding lug holes (3 closest to the front of the rig, 4 closest to the rear). 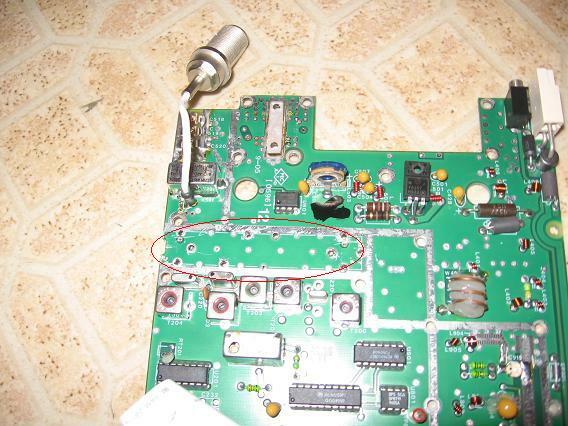 Use a small tool if necessary to carefully enlarge the holes in the RF board to allow this wire to fit. The last step in building the new filter assembly is to attach the #14 wires to the hobby brass. The wires should be about 3 inches long to ease fitting to the RF board. The length of the wires is not critical, any excess wire will be cut off after all 7 are soldered to the RF board. It helps to use the old filter as a guide when soldering the wire to the brass. You want these new ground lugs to be in the same locations as the stock filter's ground lugs. You will attach four wires to one side of the new filter assembly, and three to the other. Once all seven ground wires are soldered to the filter assembly, use a multimeter to ensure that the filters contacts are not shorted to ground. Compare the physical location of the ground lugs on the stock filters to the #14 wires on the new filters. Carefully test fit the new filter assembly onto the RF board, using needlenose pliers to bend the wires as needed. When all 7 ground wires fit, gently press down of the filters, but don't install all the way. Check the orientation of the input and output wires. You'll need to solder these to the RF board before you can solder in the ground lugs. The needlenose pliers work well to help insert the input and output wires into the RF board. Use the multimeter to ensure that the filter's input and output have not shorted to ground on the RF board. I like to test this several times during the soldering process. At this point, I recommend reinstalling the RF board back into the radio chassis. Reassembly is reverse of removal, so refer back to the top of this page if necessary. You'll need to make sure that the VCO cover will fit with the new filters installed. Don't push the filters all the way onto the RF board, or they will short out on the RF board. You've got a little bit of extra vertical space, as the new filters are shorter than the stock filters are. You may want to solder one of the filter's ground lugs to prevent movement, then install the VCO cover. This will prevent movement while you solder the remaining ground lugs. Once all 7 ground lugs are soldered to the RF board, use the trusty multimeter one last time to ensure that the ground lugs correspond to chassis ground, and that the input and output lines are NOT shorted to ground. Reassemble the entire radio, and test with your 902 transmitter. Congratulations, you're done! Use a service monitor to test the rig's sensitivity. Seems like the average is about .35 uV which is pretty respectable.. The 800/900 MHz Johnson radios are equipped with both PL and DPL squelch, which gives the user endless possibilites when it comes to eliminating unwanted noise. However, the PL/DPL squelch is only active if the microphone hanger is grounded! The mic hanger 'feature' can be impractical, or just plain unwanted. This mod grounds the mic hanger line inside the radio, and is performed just like EF Johnson used to do it. This mod is a must if you're planning on using a modified 8615 as a repeater receiver, and you'll be using the radio's PL/DPL squelch. 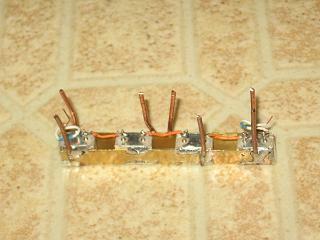 I recommend doing this mod on all radios, unless the radio will be transmitting ONLY, such as a repeater transmitter. First thing to do is to inspect your radio. Some radios were factory modified for a remote display, as in this picture. The factory installed all three jumpers for radios with remote displays. For this mod, we really only need one jumper. Remove the upper and lower covers, and remove the audio/logic board. Look down at the top of the RF board, behind the microphone connector. You'll see JU1, JU2 and JU3 screened on the board. If you see jumpers like the ones pictured here, your radio has already been modified! 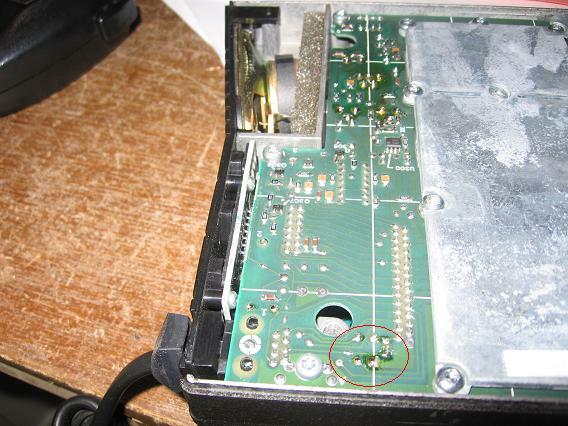 If your radio has a diode connecting JU1, remove it. Another way to tell is by looking at the bottom of the RF board, near the microphone connector. Look for a surface-mount resistor (R317) which is shown in this picture inside the red circle. This is the only surface mount component in this area. 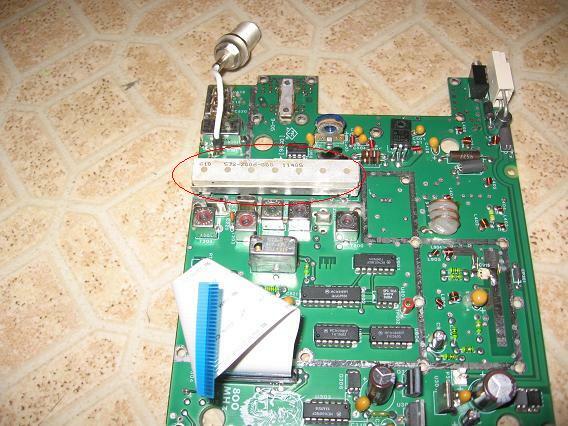 If this resistor is in place, your radio still uses the mic hanger to control the PL/DPL squelch. The first step in this modification is to remove this resistor (R317). Next, turn the radio over and find JU1 on the top side of the RF board, near the mic connector. We need to add a wire to connect JU1. I've been successful by installing the wire through the top side, and soldering on the bottom OR by simply installing the wire on bottom side of the PCB. Either way you do it, be careful not to blob solder on any adjacent pads. Congratulations, your radio now has PL/DPL squelch all the time! Some of the Johnson radios were equipped with a feature called Multinet. This feature gives each radio a 4-digit digital identity and some additional features in the software. For converting a radio for Ham use, the Multinet feature must be disabled. The new CPU and firmware will not operate with an unmodified Multinet radio. A Multinet radio can usually be identified from the outside, by the presence of a 2 wire yellow and black harness sticking out the back. The 14-wire harness found on some radios is something completely different, as it connects to the P2 connector on the audio/logic board. The 14-wire harness is typically used for connection to a repeater controller. To remove the Multinet feature, remove the upper and lower covers of the radio and remove the audio/logic board. The ribbon cable is released by gently pulling up on the clasp tabs on each side of the ribbon cable. The two-wire yellow and black harness should be cut and removed from the radio. This harness connects directly to the Multinet CPU. The Multinet CPU is pictured here, inside the white circle. This CPU should carefully be removed. 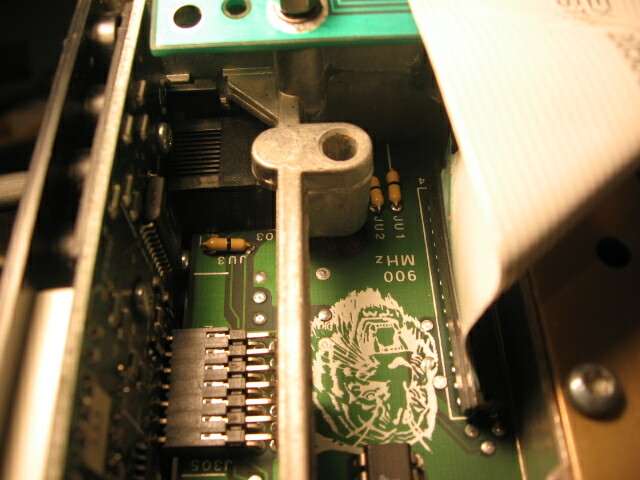 The Multinet CPU is connected to the audio/logic board with three solder connections underneath the yellow and black wires, and double-face tape on the side near the crystal. Next, we have to repair a cut trace on the bottom of the audio/logic board, and relocate the wire shown in this picture inside the white circle. This can all be done in one step, as the wire pictured already connects to one side of the cut trace. Cut this wire at the TP3 connection. Next, locate the ribbon cable connector on the audio/logic board. When the audio/logic board is oriented as in the picture, find the 8th solder pad from the left on the top row of pins. I recommend using a multimeter to verify continuity between this pin and the cut part of the trace on the other end of the yellow wire before soldering. It can be tricky to get a good connection at the cut trace, so be patient and move the probe around a little bit. 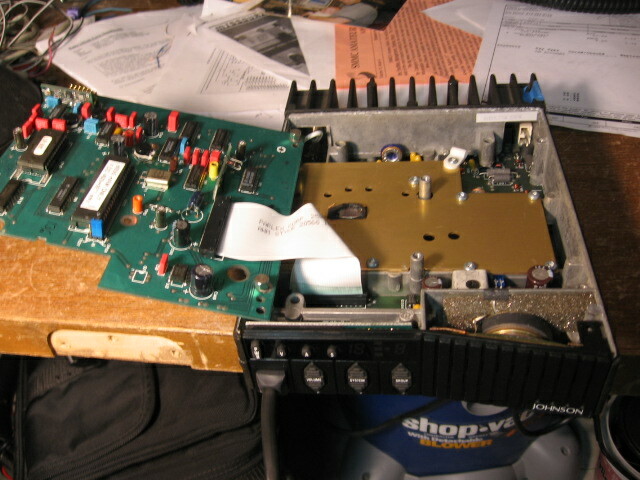 The completed audio/logic board is shown in this picture, with the relocated wire shown in the white circle. Reconnect the audio/logic board to the radio and test all functions. Please email me with your results also!